This textbook provides the reader with a foundation in policy development and analysis and describes how policy, including legal mechanisms, is applied to marine environments around the world. It offers a systematic treatment of all aspects of marine policy, including environmental protection, fisheries, transportation, energy, mining and climate change. It starts with a biophysical overview of the structure and function of the marine environment with a particular emphasis on the challenges and opportunities of managing the marine environment. An overview of the creation and function of international law is then provided with a focus on international marine law. 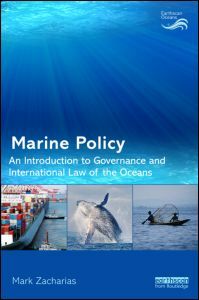 It explores the geographic and jurisdictional dimensions of marine policy, as well the current and anticipated challenges facing marine systems, including climate change-related impacts and resource over-exploitation. The book should appeal to senior undergraduate and graduate students and form a core part of the curriculum for marine affairs, science and policy courses. It will also provide supplementary reading for students taking a course in the law of the oceans, but is not aimed at legal specialists.